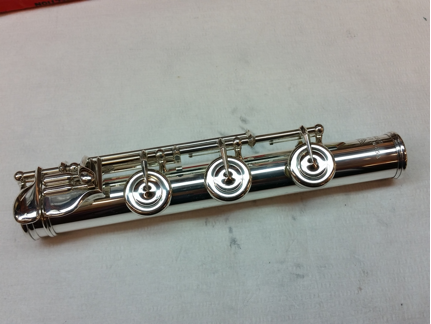 We caught up with flute finisher Karl Kornfeld this week after he completed quite an amazing transformation on flute that had been left alone, unplayed, and badly tarnished. 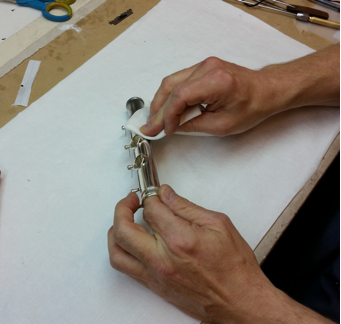 As you can see in the photo above, he was able to transform this flute back to its original beauty. 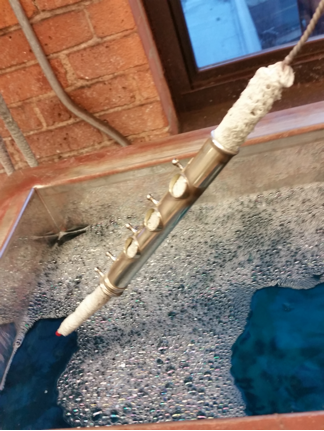 Footjoint goes into the ultrasonic cleaner first. 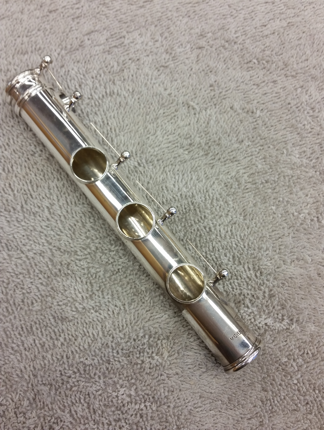 Footjoint after the ultrasonic cleaning. 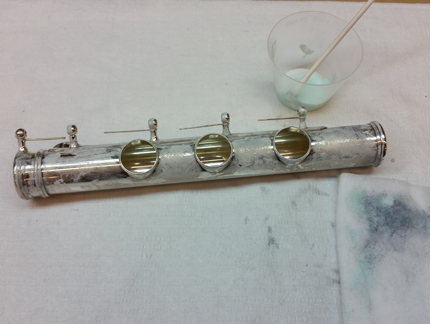 Footjoint is dipped in an acidic solution to remove the tarnish. 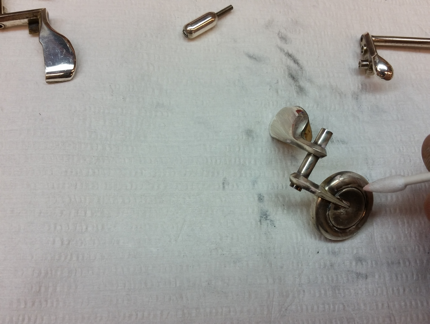 After this, it goes through the ultrasonic cleaner again. 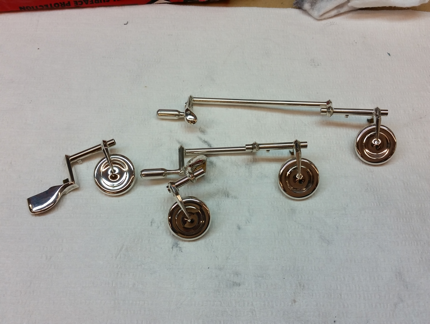 Polishing keys with a "tarnish ragging cloth." "Tarnishield" is applied to body. "Tarnishield" is applied to keys. 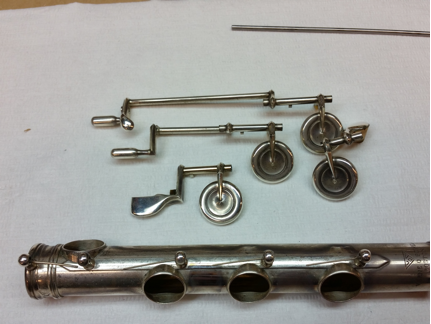 Everything is reassembled, and the tarnish is gone! The process seems pretty straightforward, and it essentially is -- but it takes a great deal of time and careful hand work. 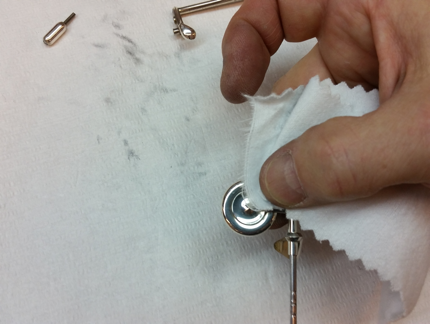 Karl told us that it normally takes about 4 to 5 hours to complete the tarnish removal and polishing process. 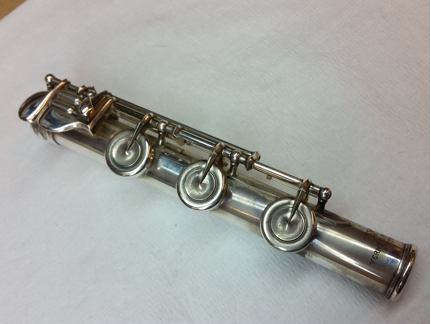 The flute featured in the photo at the very top of this post was extremely tarnished, and it came in to the shop needing a complete overhaul. 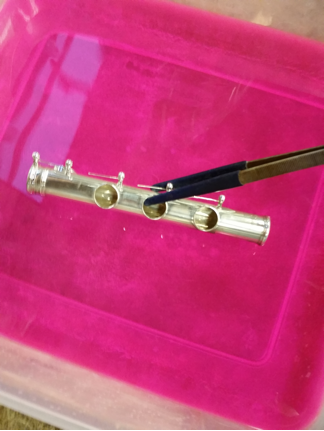 So, in the case of that flute, the total time from start to finish was roughly 19 hours!